Pakistan’s disgraced PM Nawaz Sharif may have been kicked out of office by the country’s apex court last July. However, he since seems to have beaten everyone else in discovering the fabled “aliens” from outer space right in the thick of Pakistan’s political landscape.From the day after his disqualification from holding any office of state—and subsequently barred from leading the political party named after him—Nawaz and his intrepid daughter, Maryam Nawaz, have been waging a campaign against the country’s omnipotent ‘establishment’ and the lately pro-active top judiciary. Pakistan’s constitution bars anyone in the country from defaming its armed forces and judiciary. Nawaz and daughter have, however, been openly contemptuous of the apex court. For reasons best known to the judges of the court, they have allowed the father-daughter team a free hand to go on spewing venom against them at public meetings. Lesser beings, some close minions and cohorts of Nawaz have been hauled up by the court for contempt when they tried to emulate their boss’ example. But the much-feared ‘establishment’ is a different kettle of fish. Nawaz, unceremoniously shunted out of office by General Pervez Musharraf with the ease of whacking a troubling fly in 1999, is fully conscious of the generals’ unremitted reach to discipline erring politicians.However, in his incontinent and tactical urge to paint himself a ‘victim’ of a joint ‘grand conspiracy’ hatched against him by the judiciary and the establishment he must also berate the brass. Experience, however, has taught him to be gingerly and only go after his powerful quarries with as much finesse as possible so that he doesn’t, overtly, ruffle feathers of those who may not necessarily be as tolerant of his barrage of abuses as the apex court judges. So, Nawaz, not known even among those still fawning on him for any spark of genius, has come up—obviously with some intellectual input from the coterie of self-serving minions still around him—with a catchy epithet, khalai makhlooq in Pakistani vernacular—to describe his nemeses and ‘enemies.’ His coined phrase to camouflage those arrayed against him, in his wisdom, is the closest thing to describe the aliens from outer space. But while Nawaz may pat his own back for this stroke of genius, none among his audience and intended interlocuters are at any loss in deciphering his veiled reference. To those who are well into Nawaz’s history of meteoric rise to political power in Pakistan, from an obscure and unpolitical background, his one-man crusade to avenge his downfall, however raises more questions about his agenda than it addresses his grouse that he has been wronged.Nawaz was catapulted into the mainstream of Pakistani politics under the aegis of military dictator General Zia-ul-Haq in the early 80s. What was nauseating to the feudal power-barons—they being traditional denizens of Pakistan’s cloistered political culture—was that Nawaz was ushered into their sanctum to reward his businessman father for his services to the generals. Known in Pakistan as The Asghar Khan Case (named after its principal litigant, the retired first ever Pakistani Chief of the Air Force, who passed away last year) it centres on tens of millions of Rupees doled out to military-favourite politicians—foremost amongst them Nawaz—in the 1992 general elections that brought him to power as PM for the first time at the expense of Benazir Bhutto. The scam, engineered by the sleuths of ISI, was meant to stop Benazir from winning a second term. Nawaz, its principal beneficiary, owed his triumph to his military mentors. All these facts about Nawaz’s obligations to the ‘establishment’ now savagely disparaged by him are well known to the informed. But Nawaz is counting on the short memory of the uninformed masses still susceptible to lending credence to his self-serving litany of ‘grievances’ against the ‘conspirators’ out to ruin him for good. If the turnout of people at his rallies is any indicator, Nawaz and his daughter are eminently successful in drawing out gullible crowds ready to accept their tale of victimisation under a conspiracy hatched by his adversaries as unvarnished truth; their popular applause has buoyed and galvanised him to coin the slogan of ‘aliens’ engineering his party’s defeat at the upcoming general elections in July. 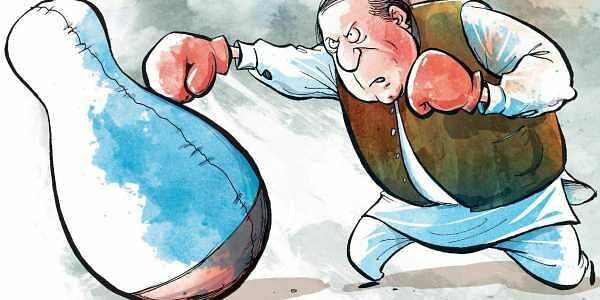 Nawaz’s sloganeering is becoming ever-more shrill and desperate as the D-Day for the incumbent parliament’s five-year term gets closer. The current dispensation, which has given Nawaz all the room to carry on his fulmination campaign against his perceived enemies, is to run out of life on May 31. After that it’s anybody’s guess how Nawaz’s crusade, which itself smells increasingly of a personal vendetta against the powers-that-be calling his bluff, would fare. An even more powerful threat to him and his party comes from Imran Khan whose PTI is making rapid inroads into what was Nawaz’s traditional power base in Punjab’s heartland. Hardly a day goes by without one or another of Nawaz’s erstwhile protégé walking out on him in Imran’s favour. Change, not induced by aliens, is in the air to Nawaz’s ultimate loss.